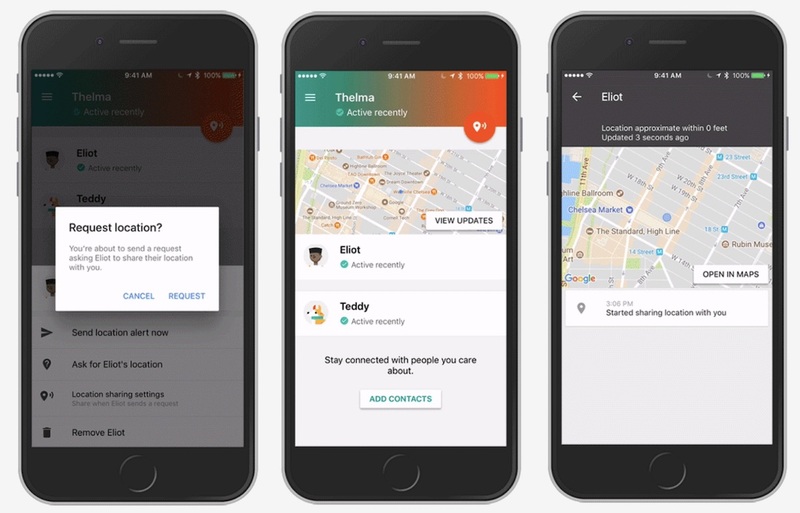 Following an Android launch last December, Google recently announced that its location sharing app, "Trusted Contacts," is out now on the iOS App Store [Direct Link]. The company described the app as a way for users to get together in everyday situations, as well as in emergency scenarios where they can let friends and family know that they're safe. Now that the app is on both Android and iOS, cross-platform location sharing is available so you can keep track of any friends and family members no matter if they own an iPhone or Android smartphone, so long as they're also using Trusted Contacts. Similar to the Android app, the iOS app supports offline use, showing those who can see your location where you were last before you went offline. Add your closest friends and family as trusted contacts. Allow trusted contacts to request your location. If everything’s fine, you can deny the request. If you’re unable to respond, your last known location is shared automatically within a custom timeframe (works even if you’re offline or your phone is out of battery). Proactively share your location if you feel unsafe or find yourself in an emergency. Integration with Google Maps location sharing, so you can easily enable permanent location sharing with selected contacts and find them directly within Google Maps. Location sharing is a popular, and controversial, feature of many apps nowadays. Most recently, Snapchat launched the "Snap Map," which lets users share and update their location on an animated map any time Snapchat is open. Likewise, Facebook Messenger launched "Live Location" earlier this year, letting friends send their location to one another directly within text conversations. Cue the Google Big Brother comments. People expressing discomfort with one corporation holding more and more detailed profiles of their searches, contacts, communications and all physical movements... what a bunch of wackos! If you were watching a sci-fi movie 10, 15 years ago and saw everyone walking around with a slab of glass loaded with an array of sensors and a global positioning system that tracks their every move, you'd say "hey, that seems like something that could be used by a corporation or government to gather intelligence and exert control" -- but somehow when it's happening in real life over the course of a decade, we're all just accepting it. I like Google, but I still don't trust them. Samsung phones have a panic feature built into them already. It would be nice to have something for the iPhone. However in real life abductions or accidents it's likely you'll be separated from your cellphone almost immediately. The SOS feature is making its way to iPhone in iOS 11. While I agree that in most dire situations you could be seperated from your phone, if it helps just one person than I think it's a feature worth adding. I don't trust them for a lot of things either but I don't know that it matters if they know where I am as long as they don't broadcast my whereabouts to the public at large. Two women in my family are survivors of horrific abductions, and I've had a harrowing escape as a preschooler, myself, so I've been hyper vigilant all my life and evaluating tools like these. On the flip side I've also been wary of location tools like these giving predators an advantage. So always approach these things with an abundance of caution and know how to manage your settings. Find my friends, but cross-platform. I like find my friends..... but, I trust Apple. I have no problem only being able to use the “safety” aspects of this w/ ppl that also own Apple devices. I guess if I literally had nobody I trusted that owned an iPhone, I’d consider this. As is.. I’m good. I’ll get exactly the same functionality with find my friends, sans uncomfortability of sharing such data with Google. Could be useful in certain situations, but sharing location on a more regular, everyday, basis is highly unlikely for most people, I suspect. "Trusted Contacts has a time-out feature which offers you a chance to decline a request. When someone requests your info, you can choose to allow your location to be shared immediately, or you can opt to have a request pop up for manual approval. To ensure that your trusted contacts can find you in an emergency, a time-out will automatically share your location if you don’t respond to the request within a preset time. By default, that’s five minutes, but you can set it to 15 mins, 30 mins or one hour. There is also the option to proactively share your location with someone if you feel unsafe. The request approach to me makes this more useful on a casual basis. For example, if I’m organising a cycling club ride, it would be handy to share my location on the day of a ride to make it easier for everyone to find me at the start. I wouldn’t want to give someone I don’t know well access to Find My Friends, as I may not remember to remove them afterwards. But because I’ll be alerted to requests, I’d happily add them to this app." This is simply a way for Google to get users to agree to let them GPS track your location at all times. Most wouldn't buy in to allow everyone to see their location but by limiting it to your immediate friends/family, far more will agree to turn on continuous GPS tracking, allowing Google to compile even more information on where you go. This data is valuable in advertising to you based on places you frequent. Verizon and other major phone providers offer this as a service for years. In many cases, it doesn't even require installing an app.